Cigars and Scotch are naturally found in the same places in this world, but when in Davidoff of Geneva’s cigar store off Madison Avenyue the unexpected pleasure of free mixed drinks entered into the cigar lounge. After enjoying a Vodka and OJ I went outside to see what Vodka line had showed up. 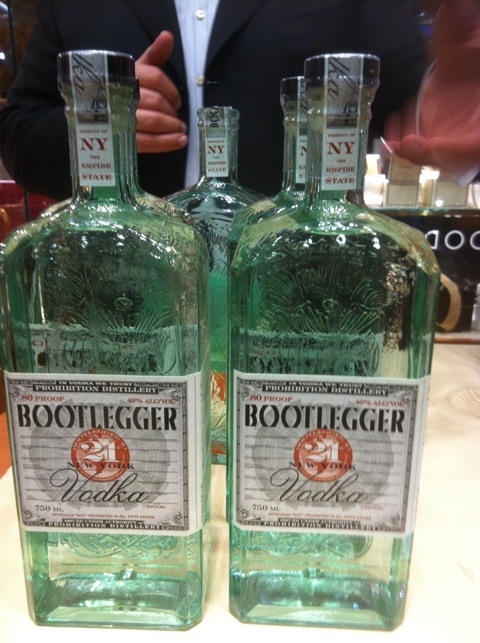 The Vodka was called Bootlegger 21 and was a new product out of New York. The representative is one of the partners in the upstart and was eager to tell how the Vodka had come about and where they are in entering the market. Now I know what you are thinking, vodka is vodka. And to a certain measure I agree with you. The big difference with this Bootlegger vodka is the process of how it was made. This is the closest thing to what I’d call a craft vodka. Their research led them to some very old methods on how Vodka is made and more specifically distilled. Their research, which includes old Russian techniques, involves the use of charcoal filtering which evidently is much slower and more expensive than modern methods. The product though is amazing. This vodka truly has no burn at all. And it has great natural mouth-feel which is something that is usually done with adding oils to the finished product to achieve. I particularly find this branding interesting since my father was a bootlegger in Georgia back in the 1950’s. I really believe this is a must try vodka! Enjoy! Always I rejoice myself with every item of your brand.